The death knell for Chromebooks? The Samsung Dex is a clever little dock that gives you a new choice when using your handset. It works easily, and makes your phone as useful as a tablet as long as you have a spare monitor, keyboard and mouse handy. The Samsung Dex could be one of the biggest wins from the Galaxy S8 launch, with the clever little dock offering a whole new world of usability for your Samsung phone. It's basically a small, squat puck that enables you to turn your Samsung USB Type-C enabled phone (so, only the Galaxy S8 and S8 Plus at this time, since the expiry of the Note 7) in a full desktop experience. It's the kind of thing that (as another, more esteemed, journalist pointed out), had it been done by Apple, would have seen the internet go crazy with hot takes on how Apple is trying to cripple its own iPad / Macbook business... where with Samsung it's likely to go under the radar. The Samsung Dex will launch for $149 in the US (we're still waiting on regional pricing details), so it's definitely won't be the cheapest device ever created by the South Korean firm. But it is impressive, and could herald a big change in the way we use our phones in the future – after all, they're getting to the point where there's more than enough power packed inside for them to function as actual computers, so why not do something like this? The design of the Samsung Dex is, as mentioned, a small, bulbous puck with a few ports around the back. Simply flip open the top, slide the Galaxy S8 into the dock (no wireless charging here... it's all done through the dock) and you're away. The back of the device offers two USB ports, an ethernet socket and the HDMI output for a monitor. Sadly it seems you can't connect Bluetooth keyboards and mice to the phone, so you'll need to use the USB ports for that, but perhaps that's something Samsung can offer in the future. It's also powered, so this isn't something you can take around with you... but then when would you also carry a monitor and keyboard with you? It's clear that your phone is going to get hot during this time, which is why Samsung has also made the dock a cooler for the handset, dissipating heat while it's working overtime to get you working on documents a-plenty. Once the phone is slid in, you're met with the loading screen on the monitor. It's a slow, slow experience to get the phone to boot into the desktop mode in comparison to how swiftly apps open on your handset, but in terms of starting up a PC it's pretty rapid. You're then greeted with a very Windows-like environment, and that's something that's been added into Android for a while (we've seen the same with devices like the Sony Xperia Z4 Tablet in the past too). However, now that many people are becoming used to using Google Docs and Sheets in the cloud, this is pretty much all you may need – with Android apps running there too. There's even a menu in the corner for all of your apps, like Windows' Start Menu, and it's very easy to move through and open whatever you need. 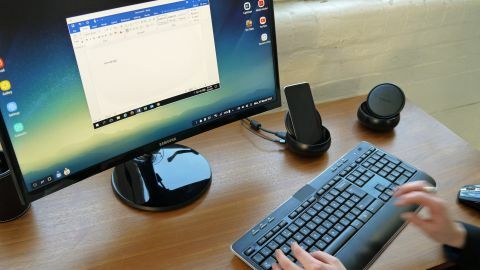 During the demo, there were some jumps and lags in the smoothness of opening and closing apps, or the mouse moving windows around the page – it's not as slick as a top-end laptop by any means. There's also the full suite of Microsoft Office apps on offer here, which means you've got all you need in order to work with anything that's been emailed to you on the go. Samsung also pointed out that the Samsung Galaxy S8 could run full Windows apps if connected to a remote desktop, as it's partnered with Citrix and Amazon Workspaces to allow you to see what's going on with your 'proper' computer and run it from your phone. This was probably the most impressive part of the demo, as once you put this remote desktop into fullscreen you're able to interact with your PC or Mac without any issues. It's unlikely that this would work seamlessly all the time, but it's something we're looking forward to trying out. The cool thing about Samsung Dex is that your phone will still work as normal in the background, with the handset still doing all its normal updating and receiving phone calls. The notification bar shows up in the bottom right-hand corner of the screen, meaning you can take and receive calls and (presumably, although it wasn't shown) create and reply to messages through the full keyboard. If you need to make the the call more private, a simple tug of the phone out the dock will let you take the conversation via the handset – although again this is a slow transition, with the phone needing about four seconds before we could begin speaking, which might be a long time for the person on the other end to wait. We've been here before, with devices like this offered up by big brands and never taking off. But there's something about the Samsung Dex that seems to be a step forward... we were impressed. Perhaps it's the fact that the world is becoming much more comfortable with the idea of working in the cloud, with Chromebooks now an acceptable laptop alternative. There didn't seem to be much missing from what we'd need from a computer when connecting the Galaxy S8 with Dex, except perhaps the need for photo manipulation, which could be handled via a remote desktop. If only Samsung would make a laptop dock version of this, an empty shell that's powered by the phone... this would almost be the headline of the whole launch. But still, Samsung has proved that the humble smartphone is a real PC rival, and the day where we toss our phones onto a wireless charging pad in the office and have our full range of computing needs instantly fire up is a step closer.